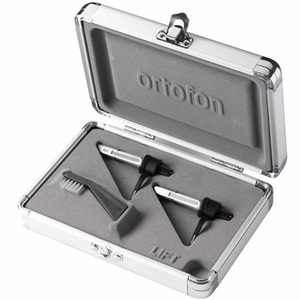 Home > Pro DJ Equipment > DJ Cartridges / Styluses > Ortofon Cartridges & Styluses > Ortofon Concorde Series (CC) > Ortofon CCS120TWIN Concorde Serato Cartridge-Twin - Free Shipping! Ortofon CCS120TWIN Concorde Serato Cartridge-Twin - Free Shipping! In addition, its design achieves an unprecedented low level of record wear, which helps protect your valuable vinyl. On top of this, the S-120 is capable of providing a level of sound quality never thought possible from a modern DJ cartridge. Included are two Concorde S-120's and a flight case.